2013 doesn’t feel all that far off, and for those of us who were born in the 1970s, it certainly sounds an awful lot like we’re living in the future. 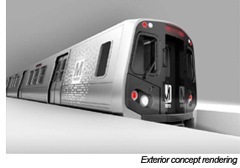 The new 7000-series cars that Metro released concept drawings for today will debut in 2013. WMATA ordered 364 of the cars to replace their aging 1000-series cars, and to run on the airport extension line. The Post got a tour of the plywood mockup, and have posted a video of the mockup, including the fancy new displays which indicate the car’s location on the various lines.